A quick overview of the beaches of Pulau Tioman, the biggest island along the eastcoast of Peninsular Malaysia. Except for Juara Bay at the east coast of the island, all beaches are located along the west coast. Northern-most beach at Kampung Salang. 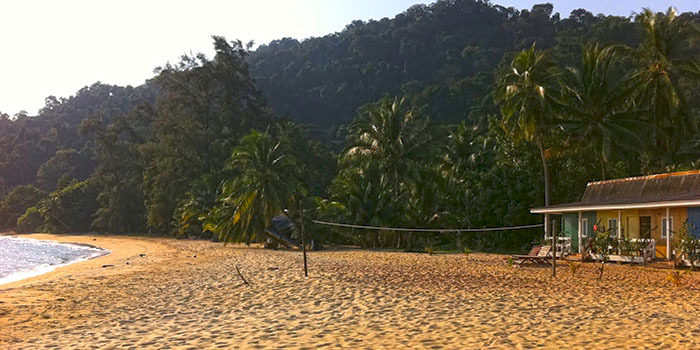 Tioman's most popular beach, especially for divers since its closest beach to many reef sites and wrecks around Tioman like Chebeh, Batu Malang and Fan Canyon and Coral Island (Pulau Tulai). There is a 3.5km jungle trail at the southern end of the beach leading to picturesque Monkey Bay and Monkey Beach and eventually Panuba Bay and Ayer Batang (ABC Village) after a trek of about 2 hours. view from the jetty. On the hillside the right: Salang Sayang Resort and if you turn around looking seaside you the small island Pulau Soyka which protects the beach from larger waves. Monkey Beach is a popular snorkel stop. There is no accommodation at the beach. Other than by boat, it can be reached through a jungle trek from the north from Salang (steep 1h trail) and from closeby Monkey Beach in the south. Uninhabited Beach just south of Monkey Bay. Spot for diving classes in shallow water. Small and quiet beach north of Ayer Batang with only one resort: Panuba Inn. Good snorkeling, be aware of sandflies. Long Beach (1.5km long) at Ayer Batang village (also known as ABC village) located between Panuba Bay (to the north) and Tekek (to the south). 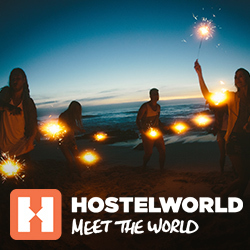 High concentration of backpacker, budget but also a pricier accommodation. The beach has a rocky seashore. Tekek is the main village / town of Pulau Tioman. All major infrastructure is located here such as banks, duty-free shops, airport, roads, the marina and the main jetty. Hence, Tekek has all the conviniences but lacks the rural character of the other villages and beaches of the island. Just south of Tekek, this beach is home to the massive Berjaya Beach, Golf and Spa Resort. There is free shuttle service available from Tekek to Lalang provided by the resort. Beach at Kampung Paya, south of Lalang beach and north of Genting. 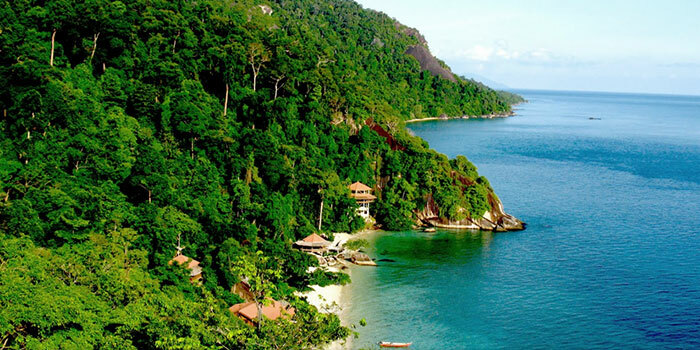 Home of two big resorts: Paya Beach Resort and Tioman Paya Resort, popular with Singaporean visitors. Beach at Kampung Genting, a larger village with a mosque. Genting has a variety of budget accommodation and is popular with local tourists. Located between Paya and Nipah. This isolated beach is exclusive the to the luxury ecoutourism JapaMala Resort. Located between Genting and Nipah. Isolated Bay to get away from it all in the south of Tioman 2.5km south of Genting and 6km north of Mukut. The ferry doesn't stop here so you need to take the water taxi from Genting. There are some beaches around the village of Kampung Mukut but there are only very few budget accommodation here. This is rather a starting point for nature lovers to discover the rainforest, the Twin Peaks mountain or the Asah Waterfall. There are a few luxury accommodation north of Mukut (Minang Cove, Bagus Place and Tunamaya). 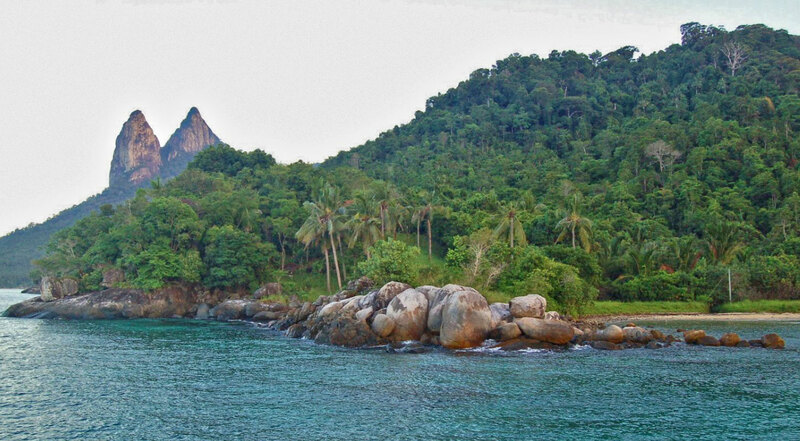 Kampung Mukut is located rather isolated at the southern tip of Tioman and can be reached by water taxi.